The name of god is very important aspect of the ancient tradition known as Kabbalah . For thousands of years, the wisdom of kabbalah was considered far too powerful for “ordinary” people. It was known and studied by only a few select scholars, theologians, and great thinkers, such as plato, Shakespeare, and Isaac Newton. Thanks to a widespread resurgence of interest in Kabbalah in the 20th century and the dedication of a new generation of kabbalistic instructors, the remarkable wisdom, sacred truths, and powerful insights of this tradition are becoming accessible to everyone. Dating back to the time of creation, a set of spiritual rules were communicated to humanity in a moment of diving revelation. This communication was known as Kabbalah. It was passed from generation to generation through a faithful oral Tradition. Once the information conveyed in this communication was recorded, it became known as the Zohar. It is the oldest sacred document in existence filled with the wisdom of the ages. The Zohar was recognized as the only method through which the true nature of the universe, and our role in it, could be understood. The Zohar was explicitly intended by god to be a tool of empowerment for all of mankind. Early scholars and mystics who studied it determined that it was far too powerful and dangerous to be accessible to people who might not realize its importance. So the Zohar remained hidden from all but a select group of intellectual and religious elite, who made it the focus of intense examination. Those who studied the Zohar were looking to receive the keys to joy, understanding, and total life fulfillment that it contained. But what kabbalists found far more incredible than the information itself was the tangible effect it had on their lives. The power of the Zohar was like nothing anyone had ever come across. Application of its insights led to remarkable, visible changes such as clarity of purpose, prosperity and remarkable relationships. It explains how we can receive the light of the creator into our lives and all the beneficence that comes with that. Kabbalah is found to contain specific, divine instructions for creating joy, love, health, and prosperity in the 21st century. Over 3.4 million people have discovered the amazing answer and changed their lives dramatically in the process. Some of the people who study kabbalah are word leaders, some are celebrities. Most of them are ordinary people. The timeless principles of kabbalah apply to everyone who seeks fulfillment and enlightenment. Kabbalah has been called the best-kept secret of our time. It is considered to be the key that unlocks all the mysteries of the universe, the secret code that governs the universe. It’s an incredible system of logic and a phenomenal system that will completely change the way you view your life. The Name Of God and the Kabbalah Talisman Tools for healing and transformation. The Jerusalem kabbalists Group (JKG) incorporates of the Names of God. These sacred and powerful names contain the divine blueprint of creation and our soul. The JKG Talisman is the key to open the doors of the unseen forces of the cosmos. It opens the doorway to higher consciousness and union with the divine. The kabbalah Talisman draws upon the power to the names of God mentioned in the kabbalah to empower us to embrace life more fully. When Moses experienced the famous moment on the shores of the Red Sea, God spoke to the Israelites in three verses as recorded in the book of Exodus. Each verse consisted of 72 Hebrew letters. Encoded in those verses was the secret technology the Israelites needed. Today, seekers can tap into this same power and energy through wearing the kabbalah talisman offers a quick and easy way to achieve joy, financial abundance, sexual fulfillment and spiritual enlightenment. The kabbalah talisman is the key to removing depression, stress, creative, stagnation, anger, illness and the other common problems of life. The kabbalah talisman utilizes the oldest, most powerful tool known to man. The power of prayer and connection to God, which is ultimately far more powerful than any 21st century remedy when it comes to eliminating negativity in ones life. The 72 Names of God sealed as a microscroll within the kabbalah talisman are not ordinary names. These sacred names represent the connection to the infinite spiritual energy that flows through the cosmos. The names define specific patterns of energy, visual mantras that are activated spiritually. 1. Unlimited joy and happiness. The kabbalah talisman will enable you to confront an overcome every conceivable obstacle to your divine right of happiness and bring into being all of the specific thing you want and need in life. Once you begin to wear the kabbalah talisman , you will possess the key to an amazing God-giving power: the power to proactively confront and rapidly transform almost any circumstance in your life: physical, emotional, material, and spiritual. This is truly technology for the soul-amazing spiritual power that no one is meant to live without! We do not expect you to accept these statements on faith alone. Use kabbalah talisman Test these statement. Wear the kabbalah talisman and experience its power in real life. Tangible results should be your only yardstick when measuring the potency of this unique talisman. And potency is what this talisman is all about. Indeed, this is an item of immense power the power of the mind, the power of the soul, and the power of the unseen spiritual forces of God that permeate our existence. When you harness the kabbalah talisman the kabbalah talisman will give you the capability to control and positively transform your entire world. The kabbalah Talisman protects us from the influences of the Evil Eye. The Evil eye is a very powerful negative force. It refers to the unfriendly stare and unkind glances we sometimes get from people around us. Envious eyes and looks of ill will affect us, stopping us from realizing our full potential in every area of our life. 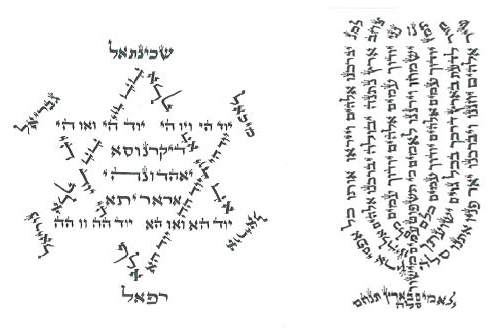 The Jerusalem kabbalists Group (JKG) write talismans according to individuals specific requests. Each talisman ia designated to address a unique problem and therefore could not be passed to other people. How much does a talisman cost ?